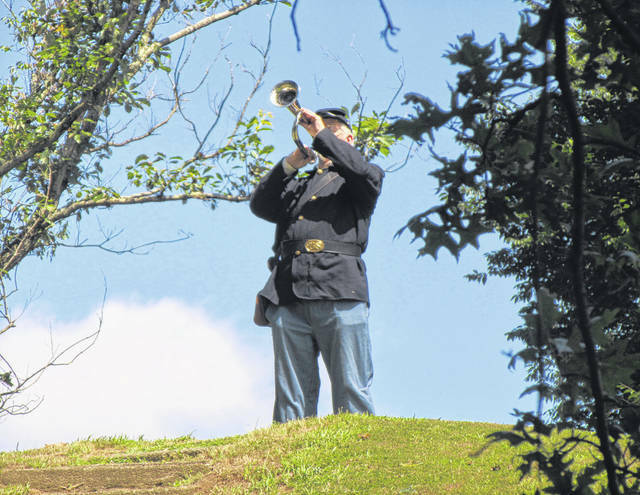 A Firing of Salute was held as part of the Memorial Service to commemorate the 155th anniversary of the Battle of Buffington Island. Taps were played to conclude the ceremony, with one man playing at the top of the Indian mound. 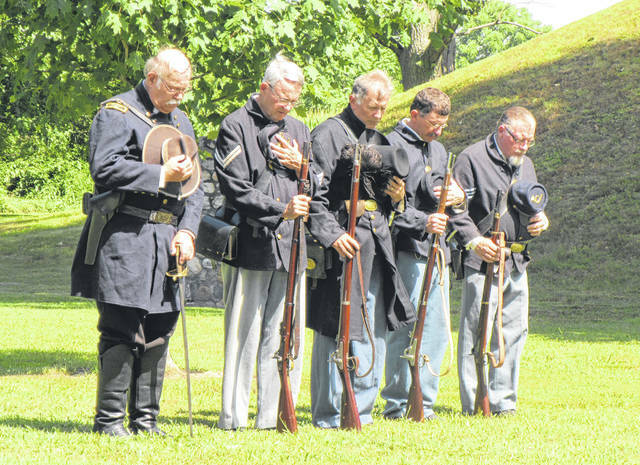 Reenactors pause to remember those lost in the Battle of Buffington Island. Steve Free played and sang during the service and during the lunch which followed. 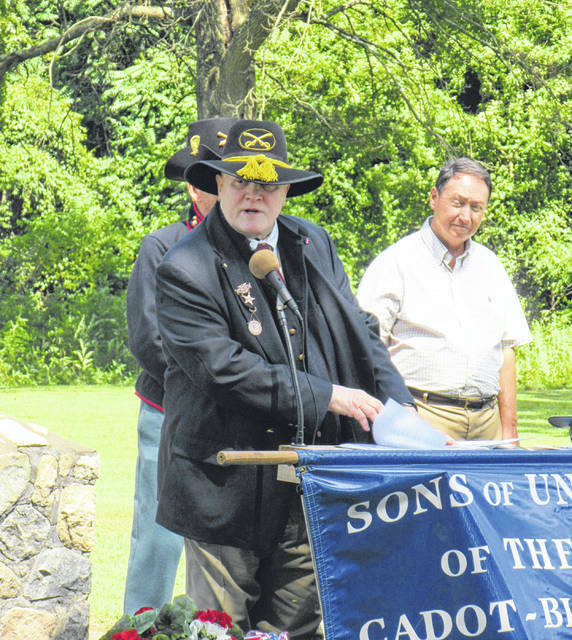 Ohio Department Sons of Union Veterans of the Civil War Commander Kerry Langdon spoke during the memorial. Henry Myers, Chaplain of the Cadot-Blessing Camp #126, gave the benediction. Service participants pause as Taps are played. Wreaths lined the area in front of the memorial. Numerous organizations came together to remember those killed in the Battle of Buffington Island. 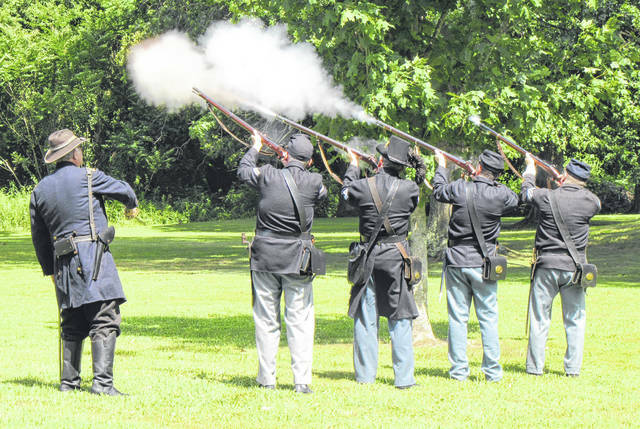 PORTLAND — Numerous individuals and organizations came together on Saturday to commemorate the 155th anniversary of the Battle of Buffington Island. Buffington Island, located near Portland, was the location of Ohio’s only significant Civil War battle on July 19, 1863. The Battle of Buffington Island was the major engagement during General John Hunt Morgan’s Great Raid into Kentucky, Indiana and Ohio. The battle, 155 years ago, lasted about two hours, involving 1,800 of Morgan’s Confederate calvarymen and 3,000 Union artillery, calvary, and infantry supported by navy gunboats, according to information provided by event organizers. While Morgan’s troops had planned to cross the river at Buffington Island, the Union gunboats and troops stopped the crossing and captured nearly a third of Morgan’s command. Morgan and the remaining forces moved north, with Morgan captured on July 26 in Columbiana County. 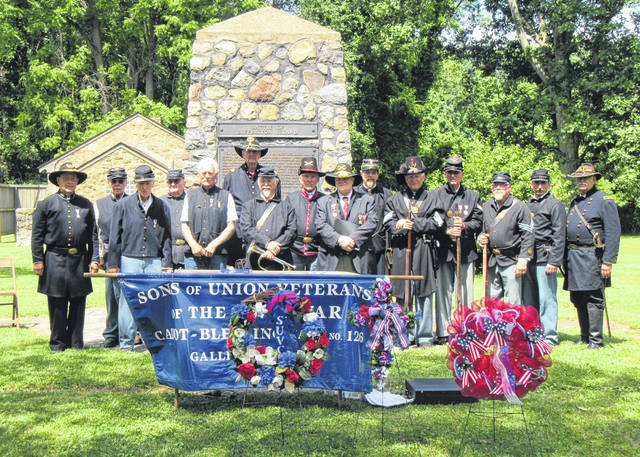 The ceremony included a brief presentation by Commander Kerry Langdon of the Ohio Department Sons of Union Veterans of the Civil War. “The Civil War was one of if not the most important event on United States soil,” said Langdon. 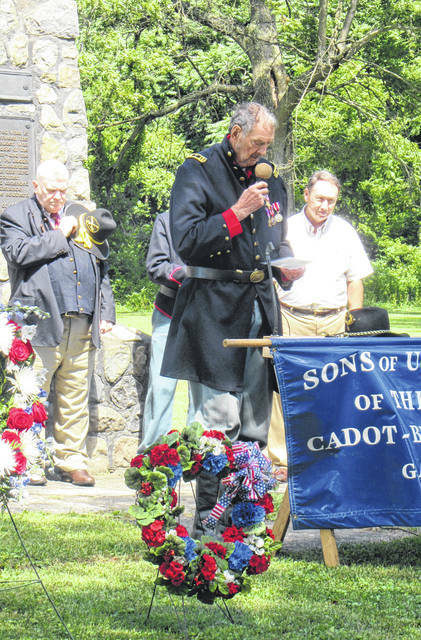 “Brothers fought brothers, fathers shot sons,” added Langdon, recalling the battles of the Civil War which put family members on opposing sides. Several wreaths were placed at the monument by the organizations involved in the day’s events. To conclude the ceremony, a firing salute was conducted, along with the playing of Taps. Following the program at the memorial site, the day’s events moved to the Portland Community Center for lunch, music by Steve Free and a presentation by reenactor William Donegan. Free, accompanied by his wife, performed two songs during the memorial service, before entertaining the crowd at lunch. Donegan performed the program “The General in General”as Union General William Stark Rosecrans. The General in General introduces the audience to the life of West Point graduate General William Stark Rosecrans, United States Army. Donegan’s presentation shared Rosecrans’ pre-war accomplishments, experiences as an architect and civil engineer and significant campaigns during the Civil War in which Rosecrans commanded forces at Rich Mountain, Carnifax Ferry and the Kanawha Valley. These campaigns helped to define him and shape his character. The year, 1863, was a year of great significance for the country and for General Rosecrans, and today is honored for his contributions. Donegan, a native of Charleston, West Virginia, enjoys history and all things historical. He is a member of the West Virginia Reenactors Association and the Federal Generals Officers Corps. As a participant in the Officers Corp, William portrays Union General William Stark Rosecrans. Organizations taking part in the Battle of Buffington Island Memorial Service included, Ohio Department Sons of Union Veterans of the Civil War, Ohio History Connection, Auxiliary to Ohio Department SUVCW, McClellan Camp and Auxiliary, Auxiliary for the John Townsend Camp #108, Sister Anthony O’Connell Auxiliary, Gen. Benjamin Fearing Camp #2 SUVCW, Cadot-Blessing Camp #126 SUVCW, Brooks-Grant Camp #7, Portland Community Center, and Buffington Island Battlefield Preservation Foundation. 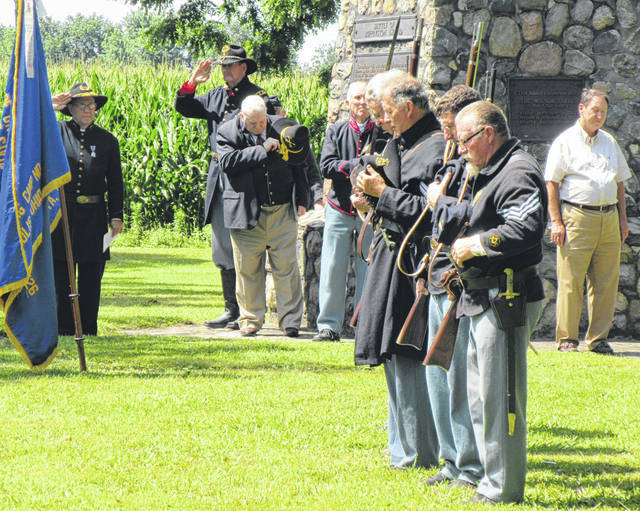 https://www.mydailysentinel.com/wp-content/uploads/sites/14/2018/07/web1_7.25-Buffington-1_ne2018724143855796.jpgA Firing of Salute was held as part of the Memorial Service to commemorate the 155th anniversary of the Battle of Buffington Island. https://www.mydailysentinel.com/wp-content/uploads/sites/14/2018/07/web1_7.25-Buffington-2_ne20187241439053.jpgTaps were played to conclude the ceremony, with one man playing at the top of the Indian mound. https://www.mydailysentinel.com/wp-content/uploads/sites/14/2018/07/web1_7.25-Buffington-3_ne201872414393175.jpgReenactors pause to remember those lost in the Battle of Buffington Island. 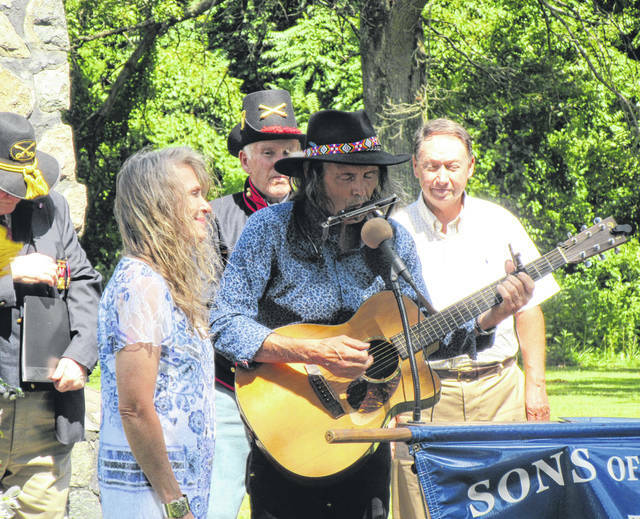 https://www.mydailysentinel.com/wp-content/uploads/sites/14/2018/07/web1_7.25-Buffington-4_ne201872414396754.jpgSteve Free played and sang during the service and during the lunch which followed. https://www.mydailysentinel.com/wp-content/uploads/sites/14/2018/07/web1_7.25-Buffington-5_ne2018724143910639.jpgOhio Department Sons of Union Veterans of the Civil War Commander Kerry Langdon spoke during the memorial. https://www.mydailysentinel.com/wp-content/uploads/sites/14/2018/07/web1_7.25-Buffington-6_ne2018724143914712.jpgHenry Myers, Chaplain of the Cadot-Blessing Camp #126, gave the benediction. https://www.mydailysentinel.com/wp-content/uploads/sites/14/2018/07/web1_7.25-Buffington-7_ne201872414391974.jpgService participants pause as Taps are played. 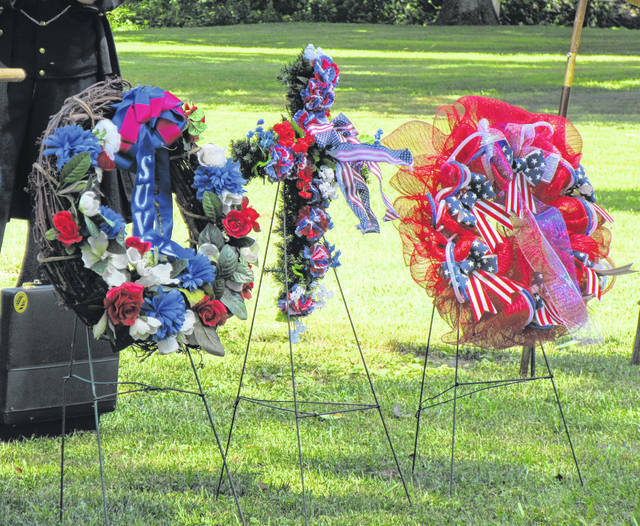 https://www.mydailysentinel.com/wp-content/uploads/sites/14/2018/07/web1_7.25-Buffington-8_ne20187241439231.jpgWreaths lined the area in front of the memorial. https://www.mydailysentinel.com/wp-content/uploads/sites/14/2018/07/web1_7.25-Buffington-9_ne2018724143927288.jpgNumerous organizations came together to remember those killed in the Battle of Buffington Island. 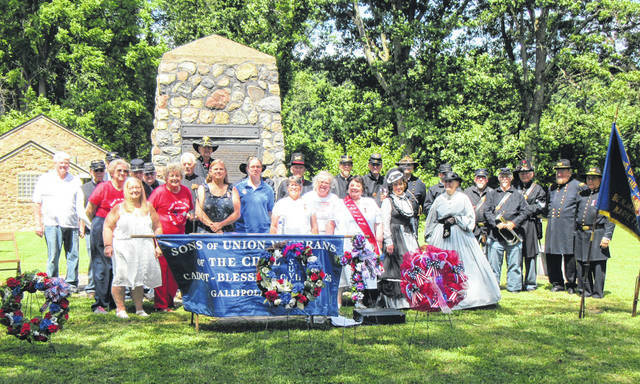 https://www.mydailysentinel.com/wp-content/uploads/sites/14/2018/07/web1_7.25-Buffington-10_ne2018724143930684.jpgNumerous organizations came together to remember those killed in the Battle of Buffington Island.